Snack Away ‘Cause Today’s the Day! Ah yes. On Saturday I was wishing myself to Cooper’s Island in Bermuda and yesterday, my silence was reminiscent of the green grass of Springtime. Can’t wait! Today, though, is International Dog Biscuit Day. Who knew? Who did that? Because I sure would like to meet him or her. Waiting for my biscuit. Patiently. As always. Even wearing my snazzy bandana! OK peep, what’s the hold up? I. WANT. IT. NOW. I have a confession to make. I love me some Mini Milk Bones. Only five calories each. But that doesn’t take into account that I think I eat twice as many as I should. And I don’t think they’re good for me. Bone meal? Really? What else is in these things? I don’t care. I love them. Happy Snacking! I love snacks. Just call me Stuart the Snackster. 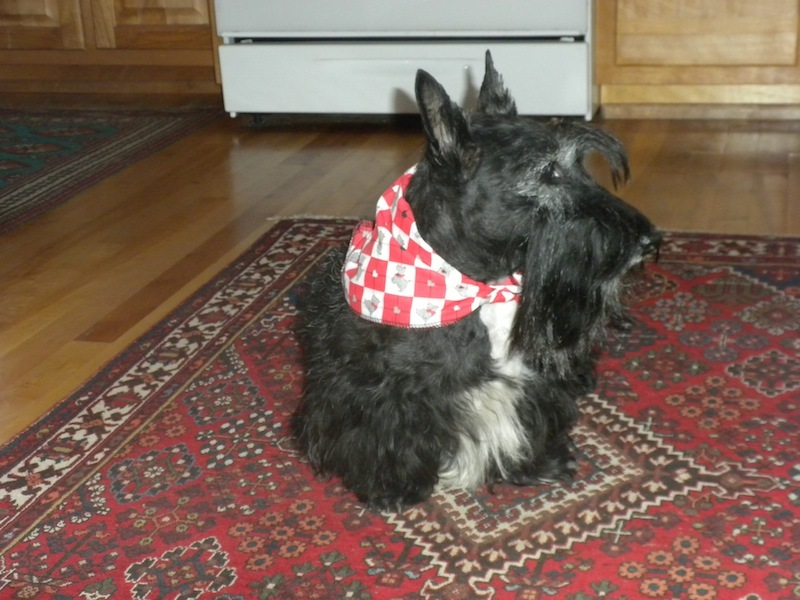 This entry was posted in dog diets, dog photography, dogs, pets, Scottie diet, Scottie diets, Scottish Terriers, Terriers and tagged International Dog Biscuit Day 2015, The Scottie Chronicles. Bookmark the permalink. 15 Responses to Snack Away ‘Cause Today’s the Day! You might want to moderate your intake otherwise Stuart the Snackster will become Jenny Craig the dieter. So, TODAY is International Dog Biscuit day? Gee, you could have fooled me. I celebrate it every day! Everyday is Dog Biscuit Day in our house. Elsa thinks you are the most handsomest Scottie around (I asked her if it was present company excluded and she said “no”!). So you make her heart go piddy-pat. Now for those mini Milkbones….Mum just opened a box last night. They are scottielicious!!!! We be lovin us some of those also – the kind with 3 flavors. You are lucky to have some as well. I wish I could give you a poi cookie! You would love them. Stuart you must really be deprived if you feel you have to dress for Mini Milk Bones. I would say that scarf speaks more to surf and turf ~ the real stuff. I luv my cookies everyday! Noooo! I cannot participate in a conversation where everyone insists on talking about biscuits and other treats. This. Dog. Is. On. Diet. and I’m in soooo much trouble already for gaining weight this week. Enjoy while you can and have a milk bone on me!